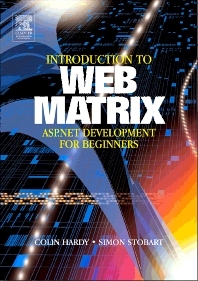 An Introduction to Web Matrix provides an easy to follow treatment of the application of this new software, which is rapidly becoming the preferred vehicle for the teaching of website design. Written by two experienced users, the material is presented in a way that makes it ideal for students meeting the subject for the first time, whether they are on an undergraduate or postgraduate course. The scope of the book includes the functionality of the software, its installation and application and the design and operation of web-based material using it. Coverage of the use of HTML and SQL is also included, as is the design and implementation of on-line databases. There are numerous examples to illustrate ideas and concepts. The examples provide a practical illustration of how the software may be used. At the conclusion of each chapter, a set of exercises is provided to allow the reader to review and practice the material presented. Undergraduates on all computing and information systems courses. Also conversion masters' programmes.